Amazon announced the Fire HD 6 and Fire HD 7 tablets. The duo of affordable tablets is already available for pre-order in a variety of colors, with pricing starting at only $99 for a Fire HD6 slate with 8GB of memory and sponsored screensavers. General release is scheduled for October 2. Amazon Fire HD 6 and Fire HD 7 are powered by a quad-core CPU with two 1.2GHz cores and two 1.5GHz cores . Both devices offer a gig of RAM and are available in versions with 8GB or 16GB of on-board memory. Connectivity is handled by single-band Wi-Fi, as well as SlimPort enabled microUSB 2.0 port. The Amazon Fire HD 6 offers a 6” display with a resolution of 1280 x 800 pixels and 252 ppi. Amazon Fire HD 7 on the other hand, makes do with a 7” 1280 x 800 screen with pixel density of 216 ppi. Both tablets offer a combination of a 2MP main camera and a front-facing VGA snapper. Additional features include a mono speaker for the Fire HD 6 and dual-stereo speakers for the Fire HD 7. Both devices offer Dolby Digital Plus enhancement. Physical measures of the Amazon Fire HD 6 are 169 x 103 x 10.7 mm, while its weight tips the scale at 290 grams. 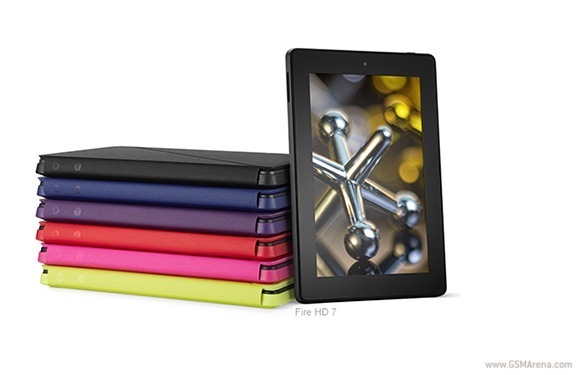 Measures of the Fire HD 7 are 191 x 128 x 10.6 mm and 337 grams. 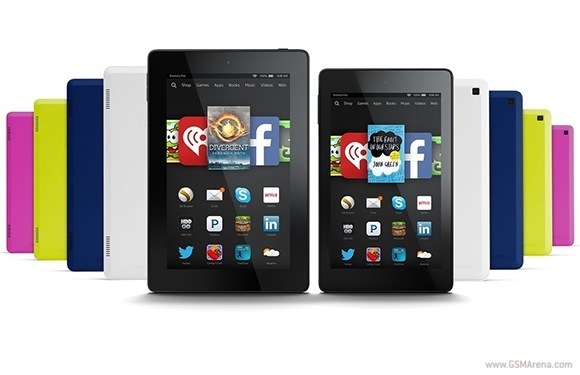 The tablets run Android-based Amazon Fire OS 4. As expected, the OS offers complete integration of the retail giant’s shopping and content services. Pricing of the Amazon Fire HD 6 tops out at $134 for a 16GB model with no ads. The Amazon Fire HD 7 starts at $139 for an 8GB model with ads, all the way to $174 for a 16GB device with no sponsored content.